Roman Catholic Daily Missal. 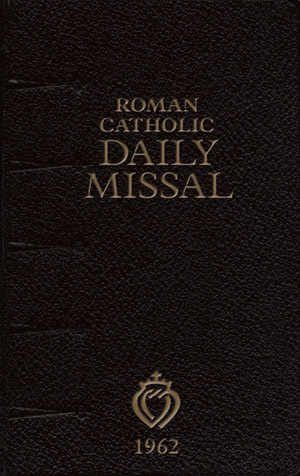 The first new Latin-English daily missal for the laity since Vatican II. This is the most complete missal ever produced in the English language while being both affordable and durable. Missal according to the 1962 edition of the Missale Romanum. Features include: 1,980 pages, all liturgical texts in Latin and English, all readings in English (Douay-Rheims) and Latin, all music in Gregorian notation, gilt edges, five liturgically-colored ribbons, sewn binding, rounded back with durable, leather-like gold embossed flexible cover, rounded corners on pages and cover, and more! No. 2207.